Subscribers with several networks, notably AT&T and T-Mobile, reported being unable to download data or use their apps for hours soon after receiving a “presidential alert” test. AT&T blamed an unrelated hardware problem. 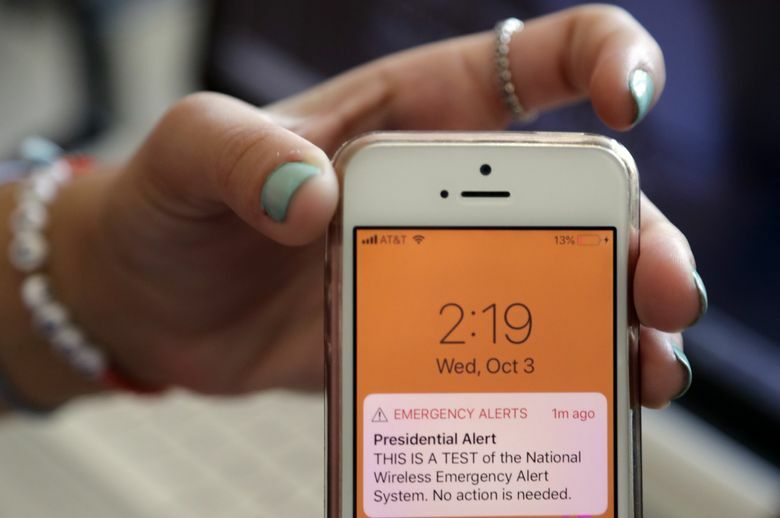 Cell phone networks across the Pacific Northwest were hit by a mysterious disruption this morning minutes after the inaugural “presidential alert” — although at least one cellphone provider insists the two events were not related. The presidential text alert, which was slated to go out to 225 million cell phone users nationwide at 2:18 p.m. Eastern Time, was reportedly plagued by other glitches. In some parts of the country, some cell phones users were reporting not receiving the message at all, according to several online accounts. If you didn’t receive the alert, the Federal Emergency Management Administration (FEMA) says there are several reasons that may happen. An older cell phone (before about 2012) may not be WEA compatible, a cell phone may have been off or in airplane mode, it may have not been within range of an active cell tower, or a wireless carrier may not have participated in the test. A spokesperson for T-Mobile said the carrier had been warned by FEMA that cell phone users could expect up to a 30-minute delay in receiving the signal. But the network disruptions appear to have been unexpected. At the AT&T Wireless store in University Village, store employees were hit by unhappy customers shortly after the text alert, but were unable to give much in the way of technical assistance or even an estimate of when the network would be back on line. By late afternoon, some users were reporting a return to services. The outage was particularly unwelcome for users who depend on their cell phones for work. Some Lyft drivers were unable to use their apps or get passengers, said Mendivel, who also drives for Lyft part-time. The outage was reported by some customers from Oregon to Alaska. This post has been updated to include comment directly from AT&T.